The first five years of your child’s life are the most formative. The organisation and layout of the rooms have been carefully planned to provide a learning environment for your children where they can feel safe and confident in their surroundings. We provide a safe and caring environment where your baby will develop their first skills through sensory and tactile experiences such as messy play, floor activities, books, music and of course lots of cuddles and love. We invite parents to spend time at the nursery getting to know our staff and giving the opportunity to pass on important information regarding your babies routine. Milk feeds will be prepared by nursery staff and when your baby is ready for weaning foods will be freshly prepared by our nursery cook according to your guidance. Your baby will be well cared for, nurtured and given the best possible care. Your child’s routine will become more structured with a balance of adult led activities and free play. 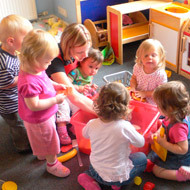 Children will be encouraged to explore, share and express their own ideas and feelings, a wide range of stimulating activities will be offered such as stories, rhymes, music & movement, role play, messy play, painting, construction & the introduction of simple mathematics, shapes, size, sorting, matching & patterns. Children are encouraged to form relationships with carers and other children. Our carers support children in their emotional well being and help them to know themselves and what they can do. 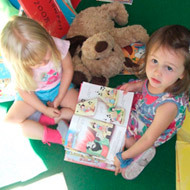 When your child joins the pre-school group they will take part in a variety of activities with an emphasis on reading, writing and numeracy taught in a fun way. The pre-school room is arranged into areas of learning, children can access our resources independently, or supported by a member of staff. The resources are age appropriate and include music, dressing up & role play, books, jigsaws, sand & water play, messy play, construction kits, science equipment, mathematical toys and ICT equipment. As well as independent play children also participate in learning opportunities offered by staff, including cooking, art & craft, music, maths games, circle time, dance, story time and many other structured activities. Staff observe children to help identify their individual development needs and plan activities to help children progress to the ‘next step’ of their ‘Learning Journey’. Children are encouraged to have respect for themselves and others, to be independent and enjoy learning. Our totally secure outdoor provision enables us to support children’s learning & development by providing opportunities for physical activities and giving children experiences of the weather and the natural world in a safe yet challenging outside play area.